It's Saturday, which means it's time to continue our look back through the sixth series of BBC America's Doctor Who. The show returns for the second half of the series two weeks from today, Saturday August 27th, and I couldn't be more excited. The episodes we're looking at today set much of the groundwork for the cliffhangers this first half of the season left us with; they are also a tightly-knit two-parter, so I've combined my original, separate reviews into one review for the entire story. Enjoy, and come back next week for the last flashback review! When I originally reviewed these two episodes, I had wildly different thoughts about them, finding part one dull and tedious and part two extremely invigorating. In some ways, The Rebel Flesh and The Almost People are a throwback to the two-part stories of the Russell T Davies years, where the first part tended to serve as a placeholder for the real story, which would come in part two. The difference is that in this case, the second part is so spectacularly good that some of the first part’s pacing flaws can easily be excused, and on reflection, I thought it better not to re-post my original reviews of these hours, since the second review largely contradicts my complaints about the first part. Instead, it’s better to review these episodes as one large, two-hour story, and together, they earn a strong B+. Not an all time classic, but a great story nevertheless, one that doles out exposition necessary for the rest of the season while asking thought-provoking questions about humanity in the process. I love the general premise of “Gangers” mining dangerous acid, and the first fifteen minutes do a very good job establishing the setting and tone of the story. The look of the episode is fairly astounding; like The Doctor’s Wife, the visuals look cinematic and inventive, and the special effects have never been better. Throughout the story, Rory is given plenty to do, and writer Matthew Graham capitalizes on the often underappreciated aspects of Rory that make him such a great character. Indeed, it’s Rory’s compassion for others that drives the biggest emotional moments of the hour. Otherwise, the episode struggles to stay entertaining. Once the ‘Gangers’ develop a mind of their own, it’s as though the story comes to a grinding halt, with Graham biding his time until he can move on to bigger (and, hopefully, better) things in part 2. We’ve seen the Doctor help a group of people run from their own creations before, and questioning the essence of humanity, as the Doctor and Rory do with the Gangers, is a very, very old science-fiction trope. Neither aspects of the story are executed well, with the ‘humanity’ conundrum in particular bringing absolutely nothing new to the table. By the time we reach the hour’s end, it feels as though no progress has been made on either front. We’re mostly where we were fifteen minutes in, only now the Gangers are out for blood. It’s frustrating because there is real potential. In the scenes between Rory and Ganger-Jennifer, Graham comes close to actually saying something substantive about the nature of humanity. Yet Graham is constantly undermined by choosing to center this story around guest characters we’ve never met before, played by actors who do nothing to distinguish themselves. They are all uniformly bland, and we are given no reason to care about any of these people or their Gangers. Even when the Doctor becomes outraged and comes to the aid of the Gangers, the moment fails to resonate, because these characters aren’t developed nearly enough for us to know why the Doctor should stick up for them. Matt Smith is great in every scene, as always, but the writing isn’t there to back him up, and any of the potential inherent in the premise is utterly wasted. I stand by my general criticism of the first hour; Graham has a lot of time on his hands here, and he doesn’t necessarily use it effectively. Still, none of that hurts the second part of the story, which is absolutely fantastic. And not just in the last few minutes, either. Any discussion of The Almost People will inevitably start at the end, because that cliffhanger was as effective a twist as the show has ever done, the third such moment this season (the Doctor dying and the regenerating little girl being moments 1 and 2). Not only was this revelation about Ganger-Amy shocking, but it was also thought-provoking, as it completely changes the nature of these last six episodes. But to start at the end would undermine the generally fantastic episode that preceded the cliffhanger, and I definitely don’t want to overshadow all the wonderful things this hour had to offer. Most importantly, the themes about the humanity of the Gangers resonated very powerfully this time around, and Graham proved that he did have something to add to a longstanding science-fiction discussion; the writing was all-around sharper and funnier in this back-half, the tension and stakes more palpable, and the guest-characters far more fleshed out and sympathetic. I give a lot of credit to Graham for this rebound, but in truth, the hero of this episode is Matt Smith. The Doctor – in both incarnations – was put front and center this week, and thanks to Smith’s tremendous performance, the story worked infinitely better than last time, particularly in humanizing the Gangers. By giving us a Ganger of a character we know intimately – the Doctor – we have a better understanding of the Flesh’s emotional toil, something Smith illustrated beautifully. The brilliance of his work here is that it’s funny, fascinating, and sad, all at the same time; this juggling act is one of Smith’s greatest talents. 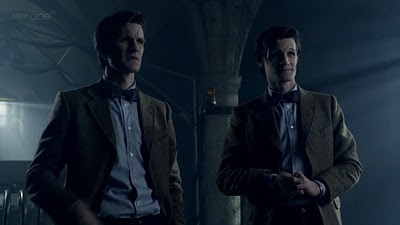 In the early scenes, it’s simply fun to watch Smith play two versions of the Doctor. Then things become fascinating when Smith makes it clear that he’s not playing two versions of the Doctor, but playing the Doctor twice. It’s a very fine distinction, but an important one. The Gangers are the people they were born from, and the flesh-Doctor has just as much right to wear the bowtie as the so-called ‘real’ Doctor. They are the same person, or they at least start at that point. In any case, they are equally valid incarnations of the Doctor, and his performance becomes very sad once we see the emotional toil that the world of the Gangers has wrought upon both Doctors. He’s seen humans reject and abuse a new species before, but never a species so closely associated with them – and he’s never had to be a part of that species scolded by his own companion. The interplay between Amy and the Doctors was a highlight of the hour, and I feel it was very brave of Graham to show such a darker side of Amy. She was openly prejudiced against this ‘new’ Doctor, which, while understandable, is still unfortunate, and you can tell how much that hurt both Doctors even as it gave them evidence about the true humanity of the Flesh. Throughout, Smith was utterly fantastic, illustrating every subtle emotion and moment of insight the Doctor experienced. Neil Gaiman’s The Doctor’s Wife gave Smith some truly amazing material, but I feel like The Almost People is an even better showcase for his performance. He plays so many sides of the character – in two forms – and balances all of them perfectly, and in the episode’s climatic cliffhanger, he hammers home how much weight the Doctor carries on his shoulders; how the choices he has to make eternally tear him apart. As much as Smith stole the show, there was plenty of other material to love. Karen Gillan and Arthur Darvill continue to do amazing work as Amy and Rory, and I love the material Graham gave both of their characters. As in part one, Graham has a particularly good eye for what makes Rory so special, and he does the same for Amy in the back-half of the story. Meanwhile, I enjoyed how the guest-characters were developed into more sympathetic characters. It helped that they weren’t front and center this week, but I genuinely did grow to like most of them before the end of the hour, even if Jennifer turning into a literal monster was a little bit over the top. Most importantly, the entire story does a great job examining the essence of humanity through the Gangers, and as we learned more and more about the plight of the flesh, the hour became more and more powerful. There was some fine action and very palpable tension throughout, but most importantly, it hit home thematically. There was a thoughtful purpose behind the action, which is always how Doctor Who works best. And as the cliffhanger revealed, the flesh will continue to be important past this story. It’s a good thing that, accepting a few flaws in part one, Rebel Flesh/Almost People did a very strong job introducing this new species. I certainly didn’t predict that Amy herself had been replaced with a Ganger, but in my original review of Curse of the Black Spot, I predicted much of what came to pass in the episode’s final minutes. I had guessed that the eye-patch lady Amy continually saw was actually a wet nurse, and a servant of the Silence. It wasn’t confirmed that she’s working with the Silence – though that’s still my theory – but she is indeed a wet nurse (and, of course, malevolent guard). I also theorized that “…Amy’s capture and time with the nurse is actually an event in an alternate dimension, with a different version of Amy Pond that stayed captured by the Silence; when the Nurse appears to our Amy, it’s a result of the two universes overlapping, just as the TARDIS is having trouble determining the status of Amy’s womb because the two Amy’s – one pregnant, one not – are overlapping for brief moments here and there.” Damn, I was close. Alternate dimensions aren’t involved, but I was correct in guessing that Amy’s visions of the eye-patch lady were moments where her consciousness overlapped with that of her doppelganger. I was just wrong in the particulars – the Amy we’ve been seeing is the Ganger, and the Amy locked up and in labor is the real one. It’s the same thing that happened to all the Gangers throughout the episode – they had flashes of their counterpart’s experiences. Obviously, this revelation raises quite a few burning questions just as it provides some fascinating answers. Most importantly, how long have we been following the Ganger Amy? Just when did the switch occur? We now know that the TARDIS’s pregnancy-scanner kept flitting back and forth because it was picking up both Ganger Amy, not pregnant, and real Amy, pregnant, and this first happened at the end of episode 2, Day of the Moon. But even before that, Amy’s pregnancy had been called into question. At the end of the first episode, The Impossible Astronaut, Amy reveals her pregnancy to the Doctor before shooting the Astronaut. At the beginning of Day of the Moon, however, she tells the Doctor she was mistaken about being pregnant. This, however, happens three months later, as the pre-credits sequence of Moon details the time the Doctor’s companions spent investigating the Silence. Thus, it’s reasonable to assume that Amy was switched with Ganger Amy sometime between when she told the Doctor about her pregnancy and three months later, when she said she was wrong. If that’s the case, I’m guessing the switch occurred when Amy shot the astronaut. This moment provided the cliffhanger for part one, but part two didn’t start in this same place. We saw snippets of the aftermath, but it’s all edited so that we don’t see exactly what happened when Amy fired the shot. Everything Steven Moffat does is so intentional that I wouldn’t be surprised if a future episode will revisit this scene, and we’ll see that the switch occurred during the mayhem without the characters noticing. It’s also natural to speculate that the switch occurred when Amy was captured by the Silence in the middle of Day of the Moon, and that the Amy the Doctor rescued wasn’t the real one. In some ways, this theory makes the most sense – she was abducted and merely stayed abducted – but it’s not in line with what she says at the beginning of the episode. She wasn’t pregnant (or, at least, thought she wasn’t pregnant) before being captured, so my money is still on the switch happening in-between Astronaut and Moon. Remember, Amy’s first vision of the eye-patch lady – something we now know was a vision only the Ganger experienced, seeing flashes of what real Amy saw – happened before her capture by the silence. Logically, she was already a ganger when she was ‘abducted,’ a play the Silence probably made to lull the Doctor into a false sense of security about Amy’s safety. Then again, it’s also entirely possible that we’ve only seen Ganger-Amy this season, and that the real Amy has been trapped all along. In The Impossible Astronaut, Amy grips her stomach multiple times, and we’re led to believe, at first, that it has something to do with the Silence. She herself has trouble remembering why she’s doing so, until she tells the Doctor she’s pregnant. If she were a Ganger all along, then she would, perhaps, be sensing snippets of the real Amy, who was pregnant, and that’s why she was unsure. She felt pangs in her stomach, but they weren’t real – they were just sensory flashes to the other Amy, much like the images of the eye-patch lady. In any case, we’ve spent the majority of this season following Ganger Amy, and given how much The Almost People hammered home how human the Gangers are, this revelation proved to be one of the most powerful moments of the season. Yes, this Amy isn’t the Amy we’ve known, but that doesn’t mean she’s any less Pond. Much like the two Doctors fool Amy by switching their shoes, Moffat has tricked us by giving us a Ganger Amy the whole season, and none of us suspected that she wasn’t real. This Amy may be a Ganger, but she’s still our Amelia Pond, the companion we know and love. The moral ramifications of this revelation are gargantuan – how do you treat a loved one if you found out they weren’t quite human, but are still the person you love deep down? That’s what makes the Doctor’s actions in the final scene so disturbing. It’s clear that he’s known Amy is a Ganger for quite a while. It’s hinted that he found out in this episode, insight gained by being a Ganger himself. Yet his knowledge of the situation is such that’s it’s clear he’s known for far longer – he even confesses at the end that he went on this adventure to learn about the Gangers and figure out what to do about Amy. Also notice that, early in the episode, he isn’t surprised to hear about Amy’s visions of the eye-patch lady, and dismisses them as “time memory, like a mirage,” which is an accurate, if incomplete, description of the visions. He’s known far longer than we have that this Amy is a Ganger, yet he’s treated her the same the whole time. Why, then, did he become violent in the end? There’s no way around it – the Doctor murdered Amy in the final scene, just as multiple Gangers and humans were murdered throughout this two-parter. Obviously, the Doctor knows something that we don’t, but even then, what knowledge justifies that action, especially for the Doctor, who spent so much time championing the humanity of the Gangers? Does he know who kidnapped the real Amy and created the Ganger? Has the Ganger unwittingly been spying for them, and is this an enemy so fierce that the Doctor has no choice but to take out their infiltrator? It’s hard to make any predictions just yet, but that doesn’t make the final scene any less brutal. The show devoted two whole hours to demonstrating why what the Doctor did to Amy is murder, plain and simple, and it’s an action that Moffat is clearly going to follow up on. Something has made the Doctor very, very mad, and I’m almost afraid to see what the Doctor is going to do next. If he’s willing to kill one version of his best friend in order to save the other, then there’s no telling what he’s going to do next. --Early on, while flashing through different regenerations, the Ganger Doctor references a fondness for Jelly Babies, a trait of Tom Baker’s Fourth Doctor. --What the hell was with the kid who played Jimmy’s son? That was some of the worst child acting I’ve ever seen, and it stuck out like a sore thumb in such an otherwise expertly-produced hour. 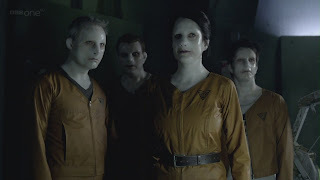 --While I really loved how the episode demonstrated the humanity of the Gangers, I felt it was a bit of a cheat that only one version of each person was left alive in the end, and only one or two Gangers (even Amy’s Ganger was killed). If the Gangers are indeed human, then these characters should have to deal with the consequences of two versions of themselves existing. --More stellar work from composer Murray Gold in tonight’s episode – he’s been on top form all season, and I can’t wait to hear the series six soundtrack. --Some have theorized that the Eye-Patch Lady is River Song; it’s not a theory I give much credence to, though I see where it comes from. Actress Frances Barber looks like an older Alex Kingston – and their hair is certainly made up to look similar – but River isn’t evil, and since we’ve already seen River’s death back in the series 4 episode Forest of the Dead, we know that she will never be that old, nor will she ever wear an eye-patch. If there’s any meaning in the resemblance, it’s a deliberate red-herring meant to confuse us. --Here’s something you should pay attention to, however; since the two Doctors switched shoes to fool Amy, Amy told the real Doctor, who is still alive, about his impending death, a glimpse into his future he should not be made aware of. This will certainly have ramifications in the weeks to come, and I wouldn’t be surprised if the Doctor has the plan he executed in the premiere fully formed by the end of next week – after all, he already knew about Amy being a Ganger, and it’s implied he knows even more that he hasn’t revealed. This, along with whatever happens next week, could be the final pieces of the puzzle that send him walking to his own death. --Of course, it’s impossible not to see the Ganger Doctor and immediately think that the dead Doctor from the premiere is, in fact, a Ganger. That’s certainly a possibility, and given how much time these last two episodes spent establishing the mythos of the Gangers, it’s not a theory we should rule out. But it’s not a theory I’m particularly fond of, because it would seem like a bit of a cheat, a solution to simple to be completely satisfying. Steven Moffat doesn’t take the easy way out when resolving stories, and I’m guessing there’s quite a bit more left to come before we see how this all comes together.